Chamber Member, Cardnial Creations, reached out to support the family of Fallen Officer, Chase Maddox. "This is what you do. You come together. We are a family. We bleed blue,” said Destin Fuller. Destin and Preston Fuller, a deputy with the Spalding County Sheriff's Department, are behind the $2 decals. “We thought it was just going to be a couple. But the first day it was about 800,” Destin Fuller said. Now, they've reached over 3,000, all the money from sales will go to the Maddox family. “To be driving around Georgia and see at least 3,000 decals on cars to see those and remember the kind of man he was, hes a brother I never got to meet but I am glad to know these will be out there,” said Preston Fuller. Pozen learned orders are being placed across the country. About $5,000 has been raised. The Griffin Daily news also ran an article, 2/14/18, about the decals and funds and awareness that are being raised through the sale of the decals. Since the Fullers are originally from Locust Grove and are also a law enforcement family, the Fullers created end of watch decals in Maddox’s honor, with all proceeds going to Maddox’s young family. Preston worked in law enforcement in Clayton County for seven years and is now with the Spalding County Sheriff’s Department. “This is what you do. You take care of your people,” Destin said Monday. News of the decals quickly went viral. 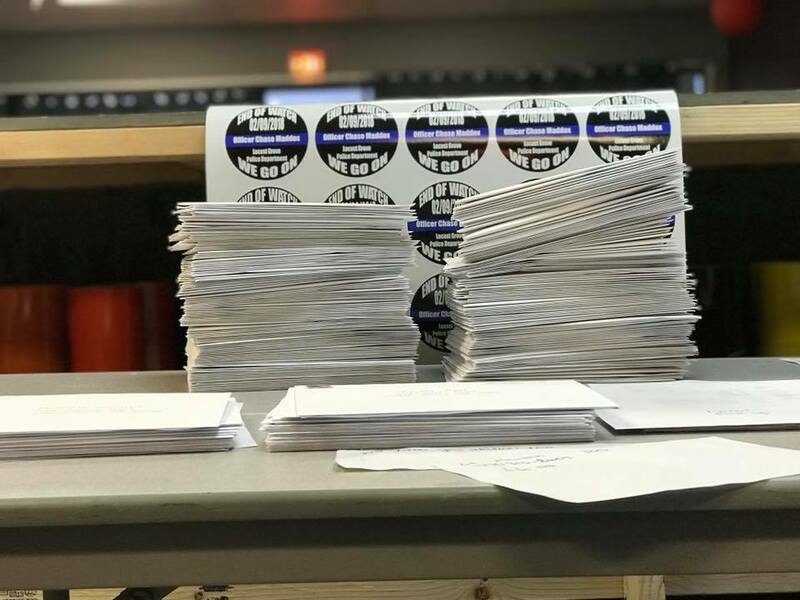 Close to 3,000 decals had been printed as of Monday, raising a total of almost $6,000. “We raised $2,000 on Saturday night at his vigil (in Locust Grove) and sold out of 800 decals there. We had to write people’s names down to ship them to them,” Destin said. “We have gotten orders from all over the United States. This is amazing!!! Cardinal Creations Vinyl Supply has raised over $6k in donations for Chase Maddox and his beautiful wife and children! With the sales of the decals and all of the donations made, you all have made this possible and this is amazing! Decals are still available for $2 a piece atcardinalcreationsvinyls.com. You can also choose in the notes section to not receive decals but to simply donate. All proceeds go to Alex and her boys. This stack doesn’t include the ones we sold out of at his vigil and ones that have been sold in store and still need to be packed!!! Keep the donations coming!! Thank you so much!!! Please go here to purchase the decals.